Home » » Nnamdi Kanu Finally Set To ‘Unmask Jubril’, Broadcasts Live From Jerusalem Nov 3. 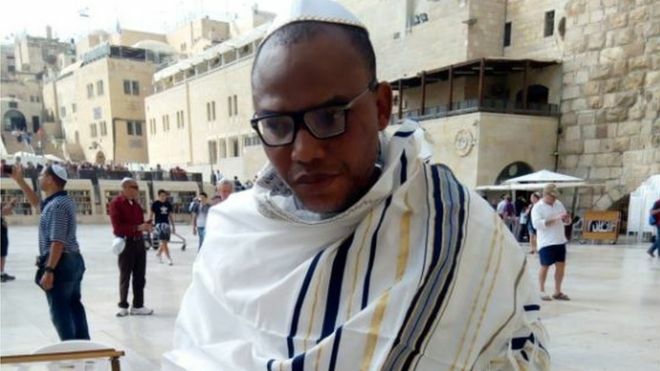 Nnamdi Kanu Finally Set To ‘Unmask Jubril’, Broadcasts Live From Jerusalem Nov 3. The leader of the Indigenous People of Biafra (IPOB), Nnamdi Kanu, will be on the much anticipated live broadcast on Radio Biafra, London, from Jerusalem tomorrow Saturday 3rd day of November, 2018. Kanu had on his last broadcast in October threatened to expose the Nigerian government and unmask a certain ‘Jubril’ whom he alleged has taken over the affairs of the country. The controversial IPOB leader claimed he will in his tomorrow’s broadcast release pictorial evidences to prove that one Jubril from Sudan is masquerading as Nigeria’s president. The live broadcast according to Carol Munday, the Deputy Head IPOB Media Team, will commence by 6pm Nigerian time.